Dental Bridge Brookline | Teeth replacement is essential to maintain your dental health. There are a few options such as dentures, dental implants, and dental bridges. However, many patients are unfamiliar with bridges. And so, we have created this blog to best explain dental bridges. Read more below. Then, schedule a consultation to learn about your ideal teeth replacement solution today! A dental bridge is a fixed teeth replacement procedure. It is ideal for one or more adjacent missing tooth. 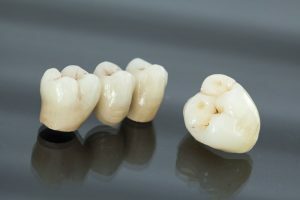 In brief, it is made of a dental crown on each end and a false tooth in the middle. A dental bridge is permanently attached to existing teeth or dental implants to fill the gap of a missing tooth. Overall, it can last up to 15 years with good dental hygiene. A dental bridge requires normal dental hygiene. We advise patients to brush their teeth twice a day and floss daily. This prevents plaque and tartar buildup which can still affect the underlying tooth or implant. In addition, avoid biting on hard food and this can loosen or damage the bridge. Contact us if you notice any change with the dental bridge such as a loose fit or chips. Replacing missing teeth is important for your oral health. Missing teeth causes unnatural teeth shifting, tooth decay, and periodontal disease. Therefore, replacing missing teeth protects you from additional dental issues. As a preventative measure, we recommend that patients maintain good dental hygiene to prevent tooth loss. Severe decay, periodontal disease, and injury are the main reasons why patients lose teeth. A great way to protect your natural teeth is with an exam and consultation. These appointments teach you about your current dental health and how to improve it. Dental Bridge Brookline | Our team at Chestnut Hill Dental Associates is ready to assist you. We provide exams and consultations to customize a dental plan that meets your needs. Schedule an appointment today. We are always accepting new patients and most insurances. Call (617) 566-0308 or book an appointment online. In addition, you may visit us at 2001 Beacon St #300, Brighton, MA 02135.